Here is a better look at the critter who watched the sunset with me in my Looking at the Sky on Friday post. We both stood there admiring the beauty. It must be a thing with me. I've had a Great Blue Heron enjoy a sunrise with me, and now also a Great Blue Heron has joined me to enjoy a sunset. 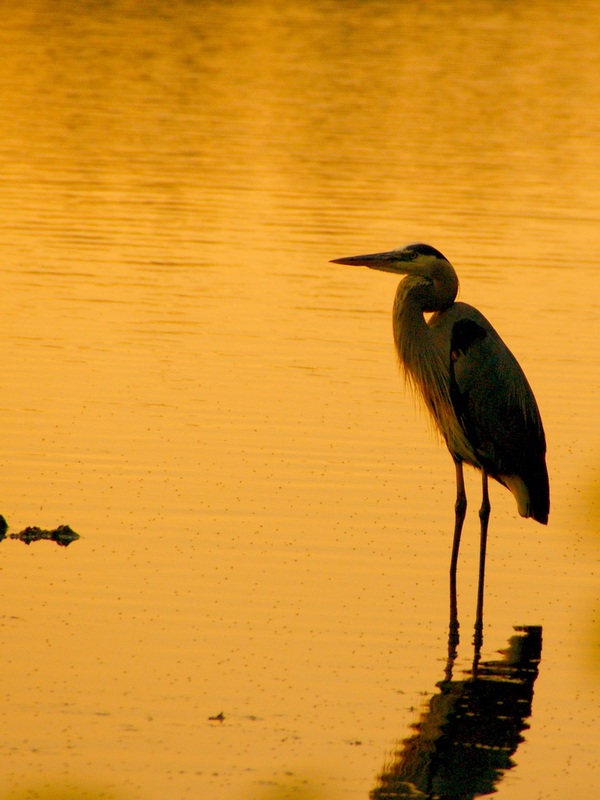 Love the golden reflection of the sun, and the bird must be thinking how long does the sunset to an end. Nice photo. You and the heron must be birds of a feather. I love these birds. So majestic. Lovely shots, Misty. Beautiful shot - a magnificent heron in a wonderful light. Amazing color, great lighting. But the thing on the left almost looks like an alligator cruising up, no?? lol !! Misty: Great shot with a special sunset sky. What gorgeous warm light you had! That is gorgeous and it must have some sort of meaning with the heron. You'll have to do some research on it. Very cool. Who better than to share a sunset with than you, Misty! This one smart bird - and gorgeous too. I love the color and the reflection. Wow, I love the colors and reflections in the water. The heron looks so serene. I love it! I have some waterfowl photos today. I was late posting, partly because I tried unsuccessfully to post a video. What a marvelous shot. I love the color of sunset. OMG! Breathtaking. One of the most beautiful pictures I have ever seen. Should be hanging on a wall! Love it. Congrats on such a beautiful capture. The amber color and reflection are simply beautiful.